23. Friday should be in each week something of what Lent is in the entire year. For this reason we urge all to prepare for that weekly Easter that comes with each Sunday by FREELY (emphasis added) making of every Friday a day of self-denial and mortification in prayerful remembrance of the passion of Jesus Christ. 24. Among the works of VOLUNTARY self-denial and personal penance which we especially commend to our people for the future observance of Friday, even though we hereby terminate the traditional law of abstinence binding under pain of sin, as the sole prescribed means of observing Friday, we give FIRST PLACE to abstinence from flesh meat. We do so in the hope that the Catholic community will ordinarily continue to abstain from meat by FREE CHOICE as formerly we did in obedience to Church law. Unfortunately, this traditional penitential practice has fallen out of practice and has gotten a bad wrap in recent years. Some warn of becoming too Pharisaical in regards to old traditions—too focused upon the letter of the law rather than the spirit of the law. There may be some real truth to that, so let’s examine reasons why we might want to adhere to this ancient custom. 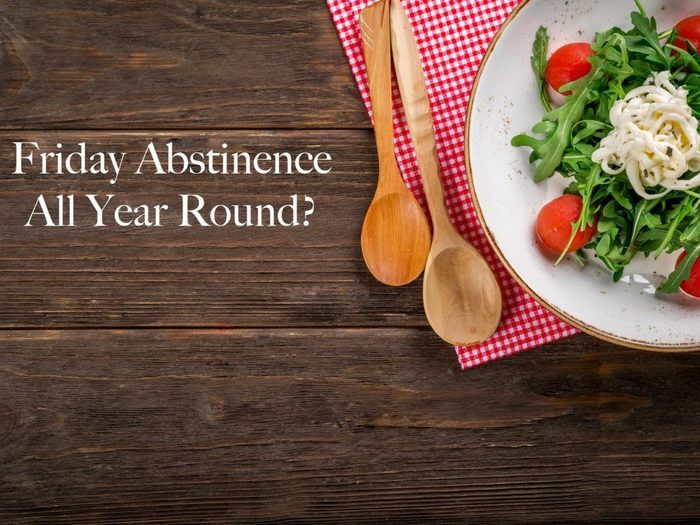 Weekly abstinence is a good practice in self-denial and penance outside of Lent, helping us to recall how our physical flesh can tend to lead us into sin. By abstaining we are reining in our body and learning self-discipline. It’s a wonderful way to offer up a prayerful sacrifice for a specific intention. Denying our fleshly desires can become a form of prayer and penance in turn leading us to greater holiness. Abstinence is good both body and soul. It makes remembering the binding law of abstinence during Lent a lot easier if it is a habit throughout the year. As a family practice during the regular week, it can remind us we are Catholics and called to continual conversion and acts of penance. Christ gave up his own body—his own flesh—when he suffered and died on the cross on Good Friday. Our simple act of abstaining should call to mind Christ’s selfless sacrifice upon the cross. We had been practicing Catholics for several years before we stumbled upon year round meatless Fridays. As a general rule, we try our best to adhere to abstaining from meat as a family every Friday of the year. Sometimes, the inconvenience of abstaining is too great (such as attending a party or having to eat in a restaurant whose meatless options are either non- existent or can not meet some of our special dietary needs). On these mostly rare occasions we choose another penitential practice to replace abstinence form meat—such as fasting from a meal, giving up dessert, or fasting from social media. For the most part this habitual practice has not been all that difficult and has led to an increased understanding of the meaning of penance in our family. Dear Sistas, I am not writing here to pass judgement upon whether you choose to eat meat on Fridays or not. What I do desire is to encourage you to search your heart and ask yourself what is really keeping you from adopting/adhering to this tradition. If your reasons are legitimate, what are you doing to replace this preferred (according to the USCCB) penitential practice? If your reasons are superficial, I’m encouraging you to make the commitment to give up meat on Fridays—not because you feel you have to fulfill some kind of empty religious requirement but because you really do see a need for penance and can offer this small sacrifice for yourself, your family, for the Church, and for the world. Trust me, I know not everyone likes fish and 52 weeks of tuna casserole very well may be more penance than a family can endure. Dietary issues might also play a part in eschewing Friday abstinence, as they do in our family. We can not have dairy and so typical cheesy Friday dishes are not an option for us. We Catholic Sistas will not leave you in the lurch. As a way of encouraging and helping in choosing meatless meals the following links to recipes, cookbooks, and cooking blogs are provided.